21-May-2001 -- The point is about forty miles south of Eurika, NV, in the Little Smoky Valley. Little Smoky Valley runs north-south between the Antelope Range on the west and the Pancake Range on the east. The point is right on the west edge of a county road in a rolling, arid, sparsely vegetated environment. Poor maps and inattention sent me on a tour of most of the valley and some of the Pancake Range foothills before I located the point. The Willow Creek Ranch on the west side of Little Smoky Valley was pretty neat, though, and there were lots of wlidflowers in the foothills. #1: T. McGee Bear facing west at the point with the Pancake Range foothills in the background. #2: Looking north at the Fish Creek Range. #3: Looking south with the Pancake Range foothills on the left. 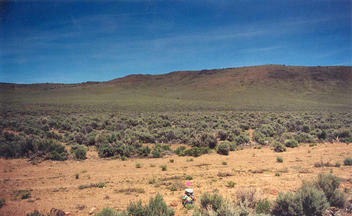 #4: Looking west at the Antelope Range on the far side of Little Smoky Valley. #5: Willow Creek Ranch on the west side of Little Smoky Valley. #6: Wildflower near the confluence point.